Over the course of three years, Joyce Meyer recorded in her journal the personal devotions and inspirations that guided her busy life. Those writings comprise MY TIME WITH GOD, the 365-day devotional that shares powerful insight into Joyce's spiritual reflections and journey. Each daily entry guides readers through a narrative of meditations, an uplifting declaration, and relevant scripture to encourage greater intimacy with God. Including spiritual revelations experienced by one of the world's leading Bible teachers, this book will renew readers' minds, offering assurance of God's complete love and desire for closeness with them. "My Time with God" is a great a devotional that is a wonderful read for 365 days of the year. 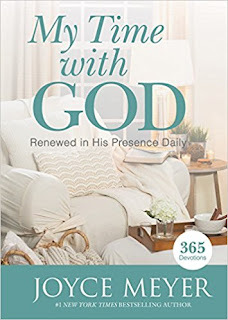 This devotional will allow you to enter the presence of God every morning as you read the devotional, pray and reflect. I love the reflections that Joyce brings in this devotional more than other devotionals that she has written. I love how the prayers written in the devotional are more of an applications, or asking people to move to action, rather then just always reflect. I love the declarations in this devotional and find this devotional to be wonderful. I love the martial of this devotional as well. It is a very nice cover with a beautiful book cover marker inside. The pages are perfect for a 5 minute read. I love that you can put this devotional in your purse for on the go or laptop bag because it won't get ruined. It is beautiful cover! If you are looking for a great devotional, I highly recommend this one as it is encouraging, uplifting and will provide you truth on a variety on topics as you study God's word. 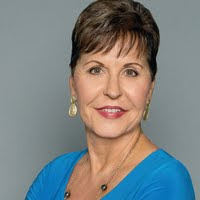 Joyce Meyer is a #1 New York Times bestselling author and one of the world's leading practical Bible teachers. Her more than 100 books have helped millions of people find hope and restoration through faith in Christ. Bestsellers include Living Beyond Your Feelings; Power Thoughts; Battlefield of the Mind; and The Confident Woman. Joyce Meyer's broadcast Enjoying Everyday Life® airs daily on hundreds of television networks and radio stations worldwide. She travels extensively, holding conferences throughout the year, speaking to thousands around the world. Joyce teaches on a number of topics with a particular focus on the mind, mouth, moods and attitudes. 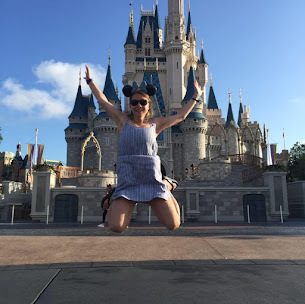 Her candid communication style allows her to share openly and practically about her experiences so others can apply what she has learned to their lives.